All natural lotion for conditions associated with mites and mange. Provides relief and helps restore a healthy ear. When ear mites attack they cause itching, irritation and possible hearing loss if left untreated. They can also spread to other parts of your dogs body! Stop the misery, reduce the risk of migration, restore a healthy ear environment and give your dog some relief. This all-natural ear mite lotion is fortified with the essential oils of pennyroyal, lemongrass and lavender. It also contains aloe vera to help soothe red, irritated ears. Safe for pets as well as the environment. Available in plastic bottles with convenient dispensing caps. Easy to apply (see Use Instructions tab). Usual application is for 7-10 days. For dogs, cats, puppies and kittens. More information on ear conditions and their recommended treatments can be found on our blog. This is my third order of your ear mite lotion. I keep giving it away. It really works – I love it! Clean ear thoroughly to remove built-up wax and dirt and gently dry ear with a cotton ball or soft cloth. 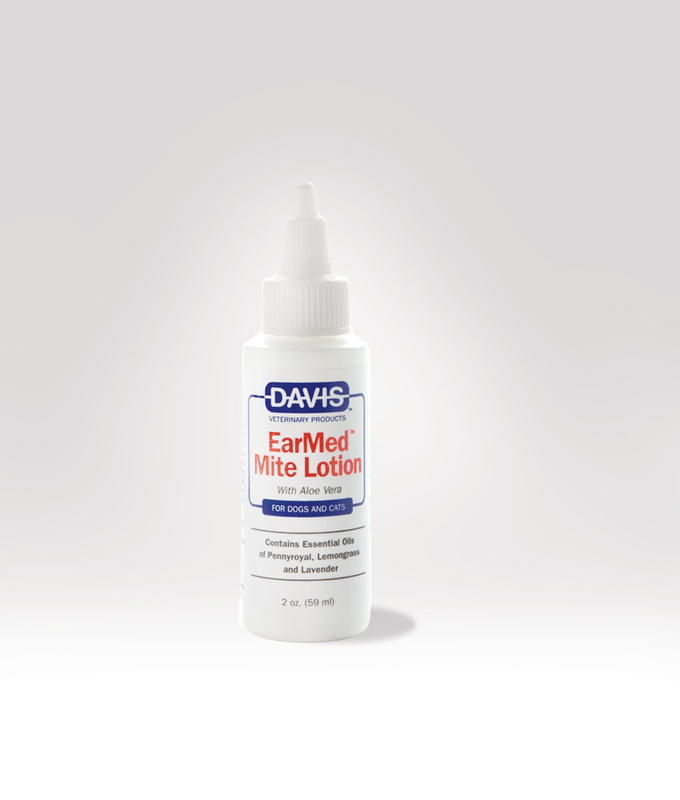 We recommend using EarMed Boracetic Ear Flush. Apply a thin film of lotion. May be applied daily for 7 to 10 days. If condition persists or irritation develops, discontinue use and consult your veterinarian. Do not put lotion directly on broken skin or an open wound. Do not use if there is suspected eardrum damage.